Chidambaram: "The solution has, however, to be honorable and acceptable to all"
SRINAGAR, Indian-administered Kashmir (CNN) -- New Delhi will adopt "quiet diplomacy" to find a solution to the problem of Indian-administered Kashmir, India's home minister said. 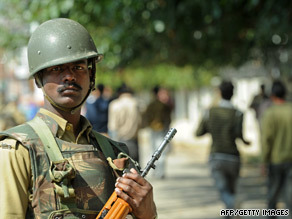 An Indian paramilitary soldier guards the filming location of Bollywood movie "Meghna" in Srinagar on Friday. Speaking to journalists on the sidelines of an All-India newspaper editor's conference, P. Chidambaram said India is "not afraid of dialogue" and is "willing to talk to all shades of opinion in the state for a solution." "The solution has, however, to be honorable and acceptable to all" and will be announced "after the contours of the political solution assume a definitive shape," Chidambaram told journalists Wednesday in the capital of Srinagar. "But we are working on a quiet diplomacy," he said, adding that such efforts are "essential to take the process forward." Indian-administered Kashmir has been plagued with secessionist violence that has claimed more than 43,000 lives, according to official figures. Various non-governmental organizations and rights groups put the number of dead at twice the official figure. Chidambaram's announcement comes days after a senior separatist leader claimed that "international pressure was devolving on India to settle the Kashmir problem." The Organization of the Islamic Conference has appointed a special envoy on Kashmir, noted Mirwaiz Maulvi Umar Farooq, who heads the moderate separatist conglomerate, All Parties Hurriyat Conference. Though the home minister said that the "situation in the state had shown improvement," he blamed infiltrations across the "Line of Control" -- the de-facto border between the two nuclear neighbors in Kashmir -- as being a major problem "largely responsible for violence in the state." "The infiltration is taking place from Pakistan, and it has increased after the general elections. The infiltration is the cause for violence in the state. But there is a zero tolerance to the violence," he told the journalists.